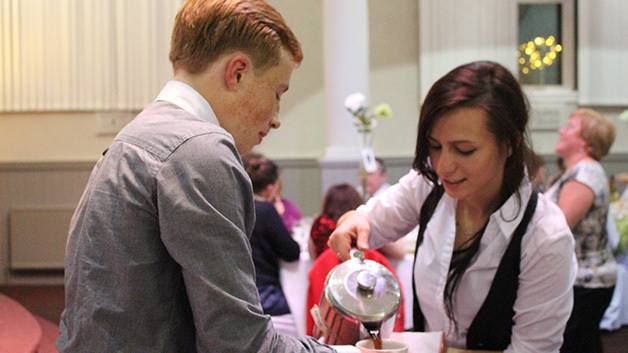 Just over a week ago, on Friday 27th November 2015, Shoreline held it’s annual Meal of Hope event when over a hundred people turned out to enjoy a meal and raise money for the community projects that Shoreline supports and provides throughout the year. The evening turned out to be a fantastic success and despite the rain pouring down outside, much enjoyment and warmth was had inside the building. The evening started with a drinks reception, and then a four course meal, cooked by our fabulous chef Aaron Goldstraw – a member of the church. Not only did Aaron cook for so many people (an achievement in itself), he also raised over £2,000 using a Justgiving page he had set up. After the food was a raffle, and then followed by an auction compèred by the Northern comedic talent of Ian Sarginson. A photo booth was provided by Paul and Mary Triller so that guests could capture the magic of the evening on film. By the end of the evening over £6,000 was raised which is an incredible contribution to the running costs for the year ahead. In previous years the focus of the Meal of Hope was solely on the Southport Christians Against Poverty Centre – a debt counselling service based at the church that is part of a nationwide charity that provides free debt counselling and advice for those in serious debt, or those struggling to manage their finances. This year however, the fundraising net was thrown wider to include two other community projects located at the church – Shoreline Foodbank and Shoreline Housing. Shoreline Foodbank operates 6 days a week, distributing hundreds of bags of food each week to over 13,000 clients each year. The operation has the support of local farms, local bakeries and national retailers such as Asda and Morrisons. Despite the support of all this fantastic organisations, the foodbank relies on the church to pay for its operating costs to keep it going every day, every week, and every year. Shoreline Housing works very closely with both the foodbank and the debt centre. Some people, often through no fault of their own, end up struggling to find somewhere to live. Whether it’s caused by family problems, redundancy, divorce, social problems or something else – Shoreline Housing exists to end homelessness and provide a home for people that is safe and secure and with no barrier to entry. Tenants do not require a deposit to move in, and if unemployed, the staff will help the individual to fill in any relevant social security documents. Along with the CAP Centre they are also now helping clients get back into work through the CAP job club which is run from another church in Southport. If you’re looking for a fantastic night out, whilst also raising money for your local community, then make sure you book into next year’s Meal of Hope!